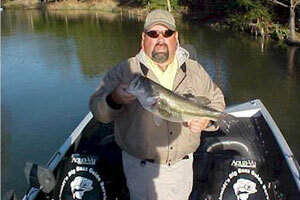 I have been fishing Richland Chambers Reservoir since the lake opened back in 1989. I have been guiding on the lake for 15 years. I specialize in largemouth bass only. I run all my trips out Oak Cove Marina(www.oakcovemarina.com). Being a large lake in the State of TX @ 44,000 acres, it can be a challenge some times to figure them out, but that’s fishing. Somehow we always seem to do it. I’ve taken the seasoned tournament angler out and all the way to the beginner fisherman. Also, in the winter months, we will slip down to Fairfield. This lake is 30 minutes away and has some awesome power plant bass fishing. I also fish a few Tournament trails. But, if a sponsor needs something done and I have a tournament, the sponsor comes first. I fished Bass Champs, Media Bass Slot Division and also belong to a small club. The club is family oriented, which is a lot of fun, because we have a ladies division and a kid’s division. 2013 Year planning on fishing Bass Champs North Div. 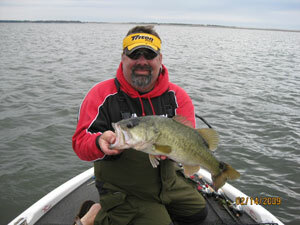 2011 Won Bass Champs event on Ray Roberts in April.